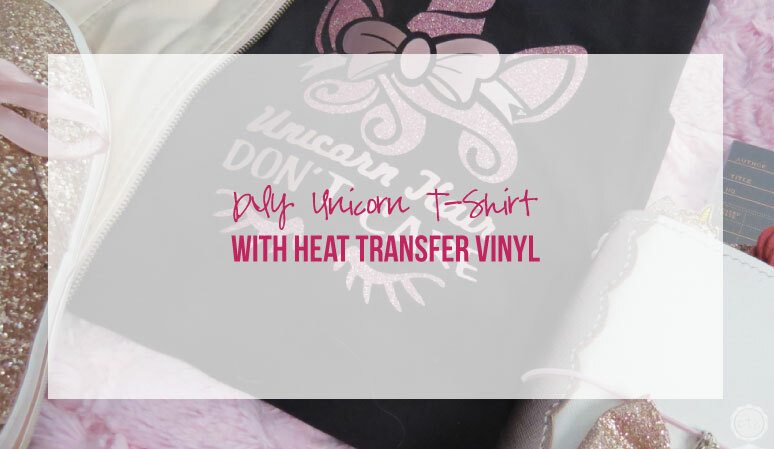 DIY Unicorn T-Shirt with Heat Transfer Vinyl - Happily Ever After, Etc. It’s time for another fun Cricut Post! 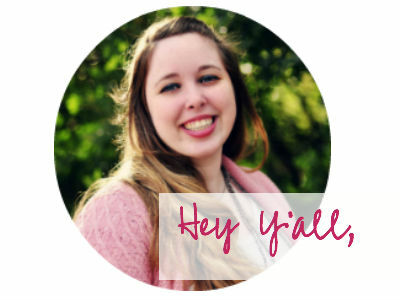 I am having so much fun learning new tricks and tricks for all of my projects… there are so many things this little Cricut can do that I’m just learning. 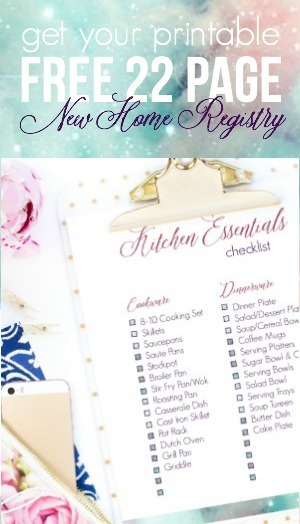 Of course, being part of the Cricut Craft & Create Challenge every month gives me the opportunity to actually pull the Cricut out each month and try new projects. 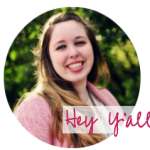 This month I’m tackling an entirely new project… a fancy new DIY T-Shirt with Heat Transfer Vinyl. 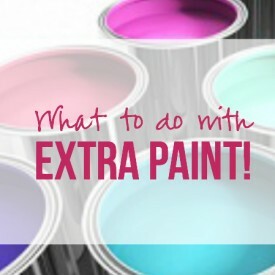 Of course, the first time you tackle a new project it takes fifty billion times longer than the second time so I’m here to share all of my tips and tricks so that you can make fun new T-Shirts the easy way (not the million step way). 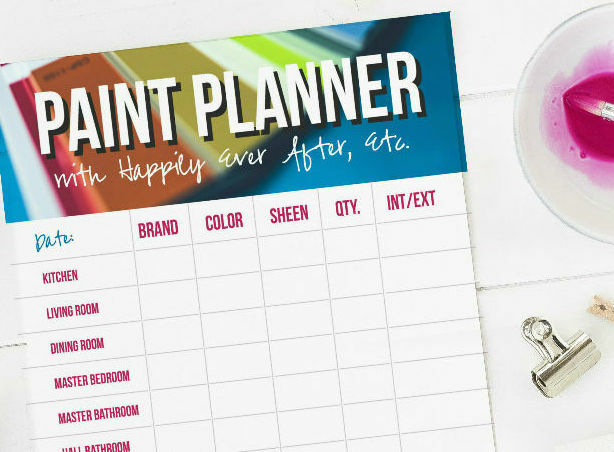 Plus, if you follow the rainbow all the way to the end there’s a pot of gold… which is code for if you read this post all the way to the end there’s a giveaway! Didn’t it turn out cute?! I am in love… literally I wore this bad boy the day after I made it. 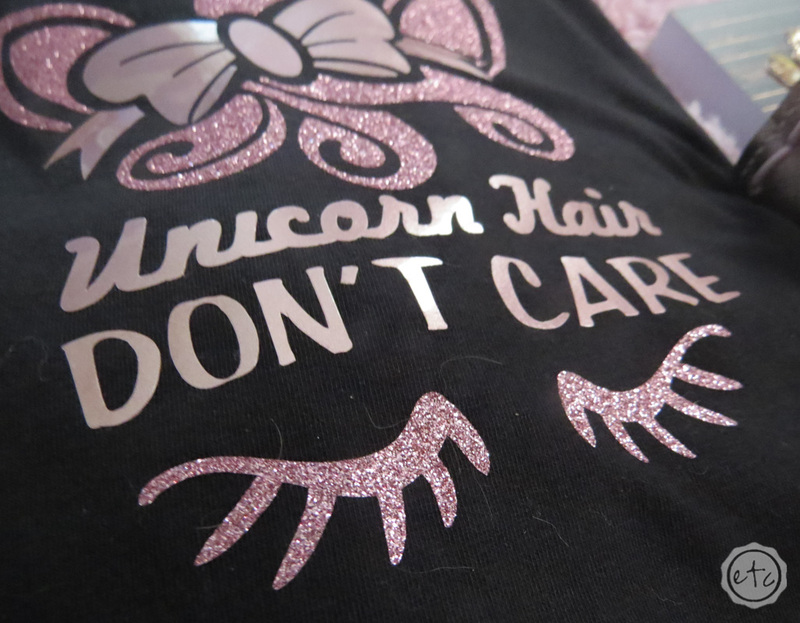 The t-shirt is so soft and I love the way the glitter looks. I’m one of those people that is easily distracted by anything shiny so I kept admiring it all. day. long. On to the good stuff… instructions! 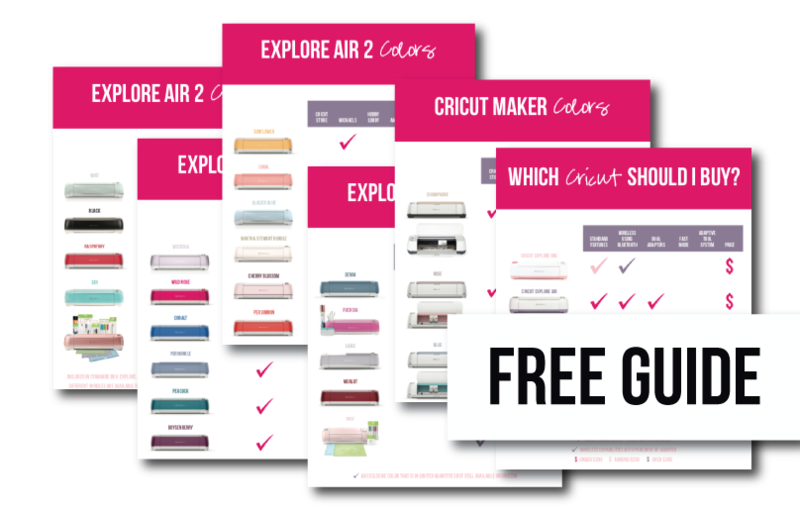 Finalize your design in Cricut Design space… I thought about actually designing my own unicorn for a couple of minutes and then decided that for two dollars I could get a really cute unicorn that someone else did all the hard work on. Complete time saver. I downloaded this sweet little unicorn from Etsy and it was super easy to upload the svg file into the program. Then it was a simple act of adding my fonts and cutting the vinyl out on my Cricut. Since I used two different types of vinyl for this shirt I simply welded the different sections of the shirt together on Cricut Design Space. This basically makes them different layers so that I can easily turn on one layer or the other when it’s time to cut. Just click the little eye symbol next to the layer to make the layer you want to cut visible. I even made the two layers different colors so I could easily tell them apart but you don’t have to do that… since we’re just cutting (not printing) the color is really not relevant. Everyone following along so far? Once you are ready to go click “Make It” in the top right corner… then when the prepare screen comes up MAKE SURE YOU CLICK MIRROR. HTV has a clear layer over the top so you must mirror your design in order for it to be the right way on your shirt. Make sure the clear film layer is pressed to the sticky side of your cutting mat and you are good to go! Cut the glitter vinyl… then cut the metallic vinyl! Easy peezy. TIP: Part of what took so long to figure out was that the “iron on” setting on my Cricut was not enough for my glitter and metallic heat transfer vinyl. I accidentally messed up an entire section of vinyl with the wrong setting before I figured that out. 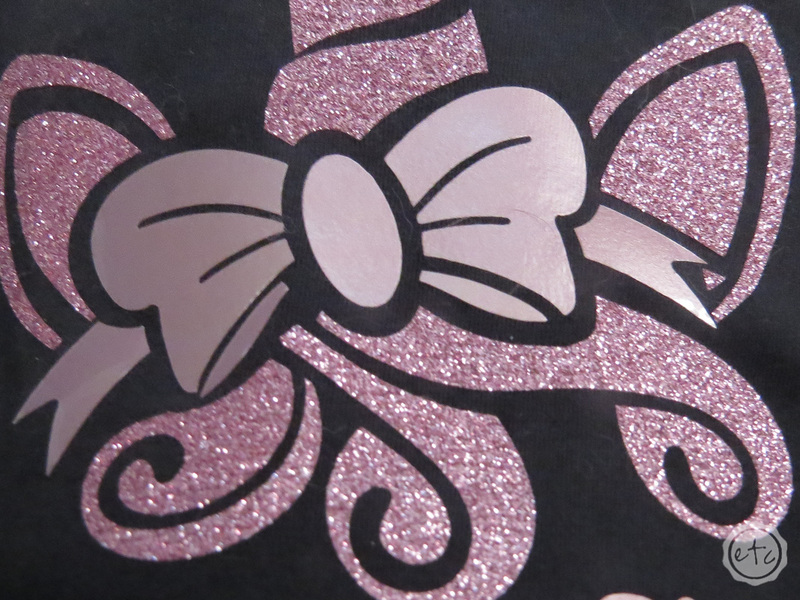 I had to set it to the “bonded fabric” setting in order to cut through the glitter and the metallic vinyl sheets. Go figure. 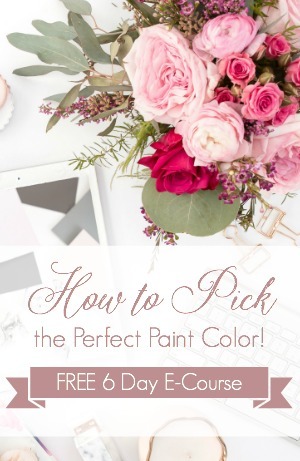 Yes… it’s as easy as it sounds. Since we’re working with HTV go ahead and use your iron to preheat the area of your shirt where the design is going to go. 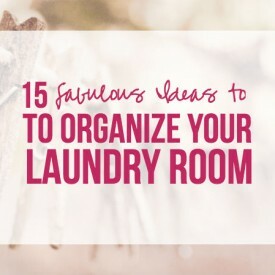 Once you’ve ironed it enough to warm up the fabric you’re good to go! Once your vinyl is cut out it’s time to place your design on your t-shirt… I used transfer tape for the metallic vinyl which made it easy super easy. The glitter vinyl is easy peezy since it has the clear layer already keeping it together… kind of like built in transfer tape. Since we’re using two different vinyls go ahead and place the first sheet… then use the iron to attach it to the shirt before placing the second piece of vinyl. It’s kind of like a two step dance here… one step forward two steps back! Worth it though… definitely worth it! Step 3: Time to Iron! Now it’s time to actually iron your design onto your shirt! If you have a handy dandy heat press then you’re in luck… just use that baby for 15 seconds and you should be good to go. 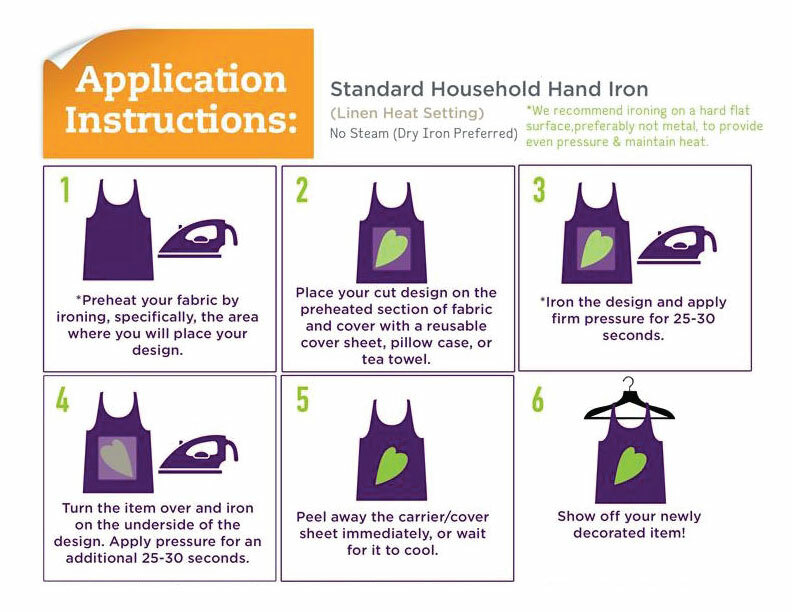 If you’re using an iron it’s still pretty simple. Use your Place a pillow case (or other lightweight fabric) over your project and iron the design. Make sure to place the iron down firmly for 20-30 seconds at a time… don’t move the iron while it’s down. You’re not ironing a pair of slacks here… if you start moving the iron all around your design may shift and your unicorns horn may or may not become slightly wonky. 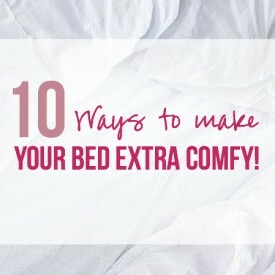 Go ahead and flip your shirt over and repeat the process from the back! Make sure the vinyl is fully bonded and you’re ready to take the clear film off! Ta-da! Liked this project? Want more awesome shirt ideas!? 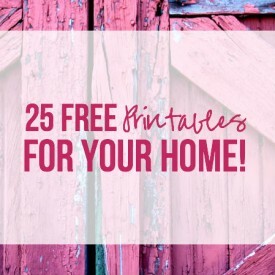 Click below to see all the DIY T-Shirt ideas your little heart can handle! This shirt is super cute! 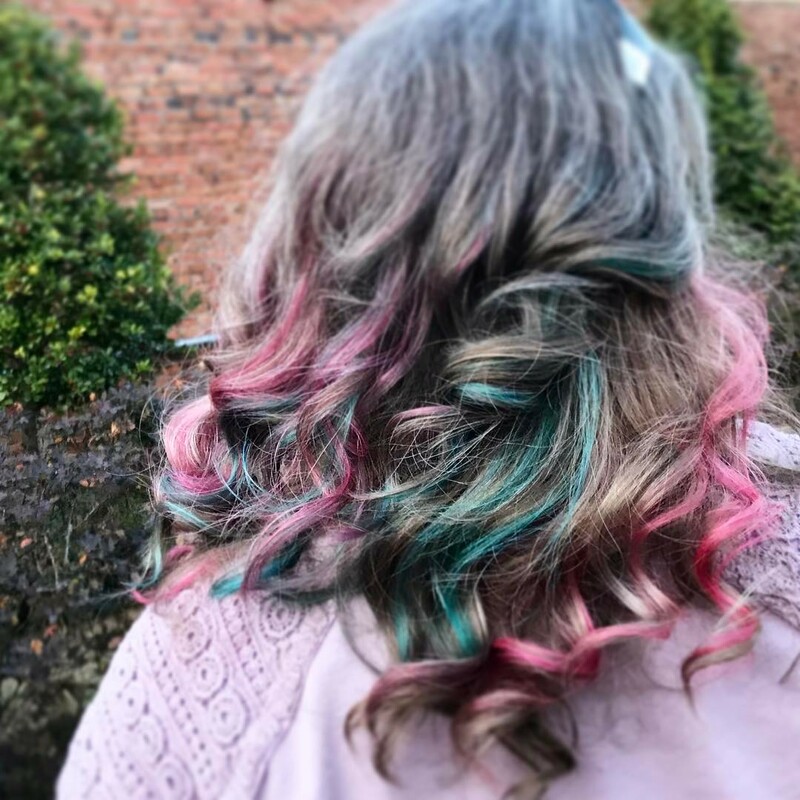 Your rainbow hair is awesome, I love it. So funny what you told your mom. lol! 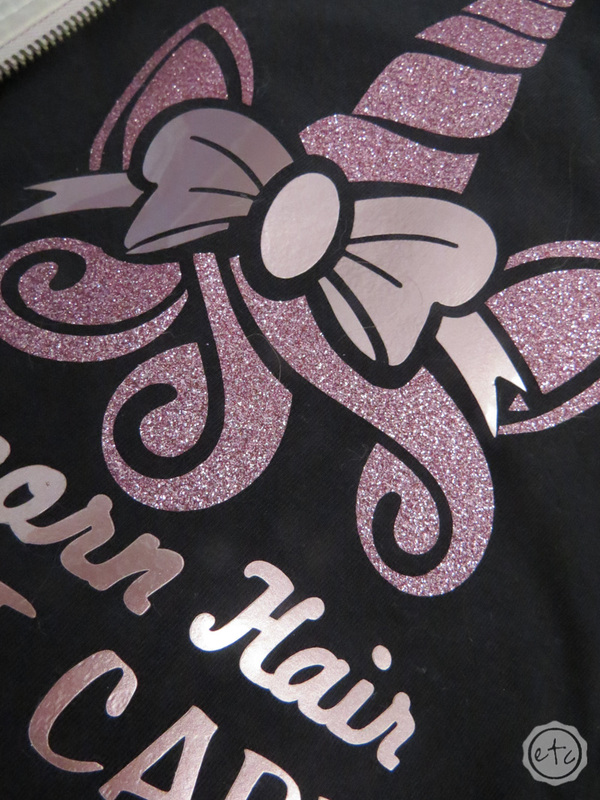 The glitter vinyl looks so good on a shirt, I’ve used it for my daughter, but not myself (yet!) Pinning! What a fun T-shirt! Love the glitter vinyl, it’s perfect for a unicorn shirt. Your hair is gorgeous, the colors are awesome! Oh my goodness- Betsy, I LOVE your hair!!! and that t-shirt is PERFECTION! I love your hair and that tee is perfect! 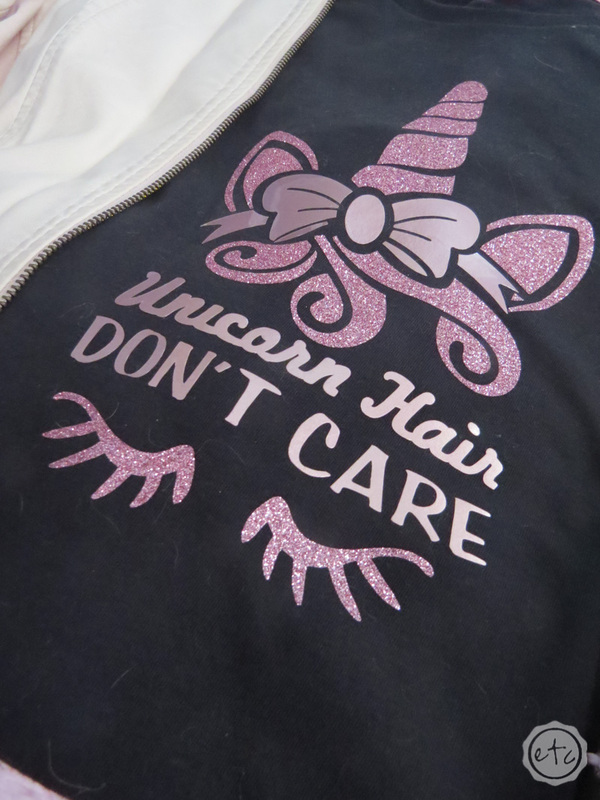 I have found the same thing out about the glitter HTV…It’s thicker than the regular iron-on. Ha, best saying ever! Hair is one of those easy, non-permanent things we can have fun with, so I say go crazy. 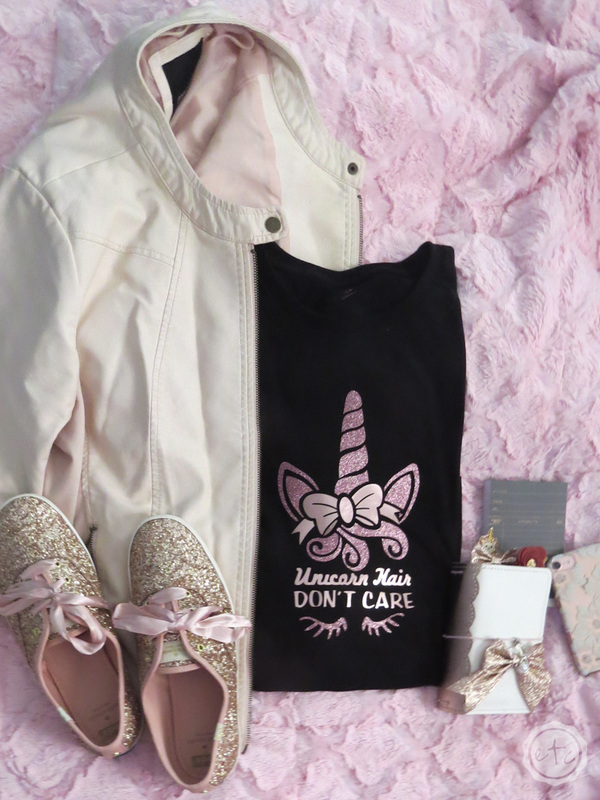 This t-shirt design is absolutely adorable and suits your cute hair perfectly! I would love this file, but I have a Silhouette. This is awesome! I believe the file is able to be purchased for the silhouette as well! Yay! This couldn’t fit your hairstyle more!!! Love it.